In my last post, because I had problems with the 64bit version of JScript not working with Quality Center 10, I went far and wide looking for a solution. My first thought was that maybe it’s not called “TDApiOle80.TDConnection” anymore. After all, this is QC version 10, not 8. I just wanted to see what the class was called, but I had no way to look at the DLL. Here’s what I did to fix that. I installed the .NET SDK (just so that I could get a little file called ildasm.exe The .NET disassembler. That didn’t give me the object name, but I went ahead on the assumption that the name hadn’t changed. I supposed I could have used “strings” if I had it installed. I also tried using the following command to make sure that the DLL was loaded. Quality Center / Test Director has hooks for writing external scripts. This is called the Open Test Architecture (OTA) These can run on the client using COM using the OTAClient.dll or from within Test Director as a VAPI-XP test case. You can download OTAClient.dll by logging in to Test Director and going to Help->Add-in Page->HP Quality Center Client Side Setup. You are prompted to install this when you first log in to Test Director from a new computer, so you might already have OTAClient installed. 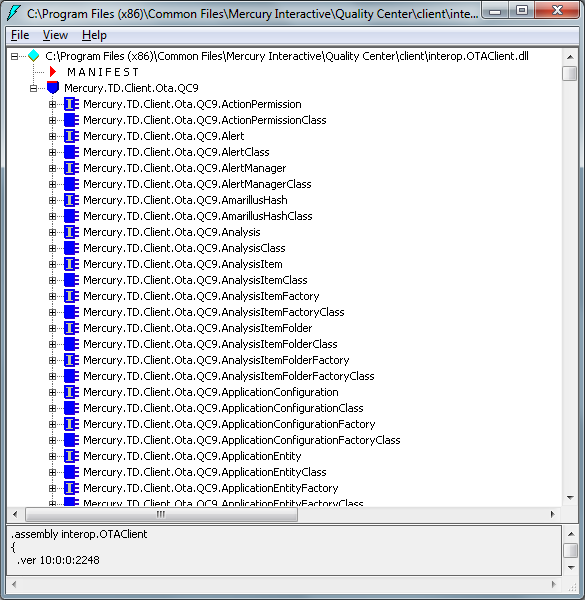 Alternately, you can just install HP Quality Center Connectivity with will install OTAClient.dll without all the client-side functionality. Note that you need to disable Windows User Account Control (UAC) to use Quality Center. The steps for disabling UAC are slightly different for Windows Vista. You can create a Test Director connection with VBScript or JScript, using Ruby or Python COM, with a Java COM Bridge like JACOB. I’m using Windows 7 x64 so I can’t use the 64 bit WScript/Cscript executable. By calling my script with the 32 bit version of CScript.exe it will work. SysWOW64 will check to see if your COM object is 32 bit and use the correct interpreter. Likewise, with Python, you need to make sure that you have a 32 bit version of python installed, as well as 32 bit pywin32. This was a pretty big source of headaches for me. The Pareto Principle is a fancy name for the 80-20 rule. If 20% of the work takes 80% of the time, suppose you had a job that took 100 hours to accomplish. 80% of the work would be done in 20 hours. The remaining 20% of the work will take the remaining 80 hours. Now, it’s a given that you don’t know which 20% that is up front. So if you cut hours across the board (or randomly, assuming an optimal distribution), you’d decrease work in an evenly distrubuted pattern. That is 80% of your savings affects the easy part (or 16%) and 20% of your savings affects the hard part (or 4%). The easy part (20 hours work) is thus reduced by 16% to 16.8 hours. The hard part (80 hours work) is then reduced by 4% to 76.8 hours. For a total savings of 6.4 hours work. This shows why you shouldn’t try to cut scope. I’m sure we all know the formula to convert Celsius to Fahrenheit, or convert Fahrenheit to Celsius. I always forget and have to experiment a bit before I get the pluses, fives, and nines all in the right places — not to mention the correct spelling of f-a-h-r-e-n-h-e-i-t.
After a bit of shuffling I figured out the righrt formulas, and got all my tests passing. As luck would have it, I had pretty good coverage with my test data. Not just a wide range of temperatures, but a wide variety of inputs as well. I’ve got positive numbers, negative numbers, zero, and even a result with identical numbers. But what could I do to improve? Failed asserting that <double:-459.4> matches expected <double:-459.67>. Failed asserting that <double:-459.67> matches expected <double:-459.67>. Clearly it was either a rounding in PHP or something wrong with float comparisons in PHPUnit. But that’s not what I wanted to talk about. I wanted to discuss how to structure tests. Let’s comment that out for now. This works reasonably well besides the duplication of test data (which could be solved with class constants), but the point I’m trying to make is that you can test a scenario better the other way. Then your test function describes your test scenario. We all know there’s a “housing crisis” and yeah, some people bought houses they shouldn’t have, but the real problem is with refinancing and home equity lines of credit (HELOCs.) Here’s an example of a house I was looking at, and if typical (which I suspect it is) represents a tremendous problem. The house was bought in 1998 by an investor who “flipped” it. They sold it (presumably for a profit) in 1999 to the current owner for $215,000. It’s in a desirable neighborhood in California and is in fairly good condition with a good sized yard. Sounds reasonable so far. They bought the home in 1999 for $215,000. The current owner puchased the home in 1999 for $215,000. A second mortgage was used for 10% downpayment of $21,500. The mortgage was refinanced in 2002 for $181,000. This could be considered the principal owed on the first mortgage (originally $193,450). A line of credit (HELOC) was granted in 2002 for $50,000. The first and second mortgage, plus line of credit were refinanced in 2003 for $270,000. This is a $5000 profit, assuming no principal was paid. Another line of credit was granted in 2005 for $183,900. Assuming no payment, that’s an additional profit of $2700. You can assume the differences in refinance were absorbed in fees. That’s a total of $7700 profit for the lenders. And a staggering $255,400 profit over 11 years for the buyer with zero investment. That’s more than TWO HUNDRED AND FIFTY THOUSAND DOLLARS extracted from the property over 10 years, with effectively no principal payed. No doubt some of that money was used to service the debt, and some of it was spent on improvements to the property, but we’re looking at more than 100% of the value of the home completely vanishing. Sure, the lenders extracted $7700 in profit refinancing, but who’s the real bad guy here?